If you love golf, you’re always thinking about ways you can improve your game. How to improve your golf swing, how to hit the ball straighter, how to chip more accurately, drive with more power. It all boils down to practice… and lots of it. And you don’t need to always be out on the green to practice! 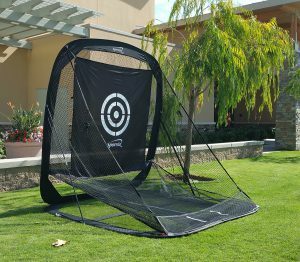 If you have one of these best golf nets for the backyard, you’ll be able to practice whenever you have a few minutes to spare – and in your own backyard! Why have one of these golf nets for the backyard? Improve your game… drastically! It’s true that practice makes perfect, so with a net at home, you can fine tune your game bit by bit, practicing as often as you’d like! Save Money: Purchasing a golf net is cheaper than heading to a driving range in the long run… no paying for buckets of balls every time you want to hit a few (or a few hundred)! Convenience: You can hit a few balls whenever you feel like it – even every night if you want to! You don’t have to leave your house/property/wife/family to enjoy swing your clubs when you have one of these set up! Simple To Use: Just line it up and send it sailing, then pull the ball back to you and repeat (many of our best golf nets for the backyard have handy ball-return features that even allow you to practice continually with just one ball). Portability: The majority of these featured are extremely portable, and come with well made carrying bags, so you can take them anywhere your golfer’s heart desires! Multi-sport: Do you have kids who want to practice hitting baseballs in your backyard? Lacrosse, soccer, football… use these backyard golf nets to protect your house also from these… and stop the balls from flying off into the neighborhood! There are actually a variety of different types of golf nets for the backyard. From extremely portable to permanent, from large to small, there are nets that will suit all sorts of golfers! 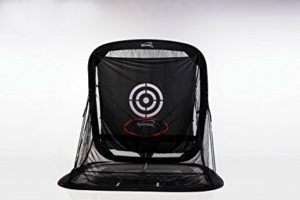 The Spornia SPG-5 Practice Net – nearly 200 reviewers give this backyard driving net (with chipping target attachment) a combined score of 4.9 / 5 stars! 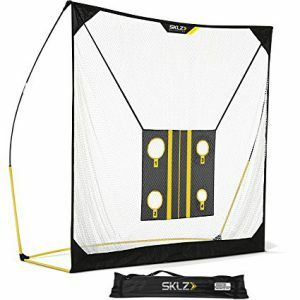 SKLZ Quickster Practice Net – for just over $100, you get a top quality driving net and an adjustable, interesting 4 target chipping target. The Spornia SPG-5. Great quality, versatile, great price. Let’s dig in and take a look at the 6 best golf nets that are just for practicing your long game. This golf net is our top recommendation. We feel it’s the perfect combination of great product, great price, and great reviews. It is also the net recommended and endorsed by the famous college golf coach Chris Haack (coached many of the pros currently on the PGA tour). He says “it’s the last net you’ll ever buy” – and reviewers agree it’s absolutely worth every penny! About The Net: Rukket nets are made of 4-ply knotless netting (knotless allows for smooth distribution of the force the ball has when it hits the net, allowing a soft, straight drop). The netting can really take a beating, so swing away, with real golf balls and any club in your golf bag, and with all of your strength! The design of the net includes Rukket’s effortless ball roll-back feature, so you can get more swings out of your practice time! The frame is sturdy, made of metal (not PVC). Size: 10′ x 7′ x 3′ It does not come with side wings, but according to many users, it’s by far large enough to stop any hook or slice you may send its way. Portability: Set up and take down is a snap with this particular golf net! It also comes with a durable carry bag that has plenty of room, so you can bring it wherever you desire! 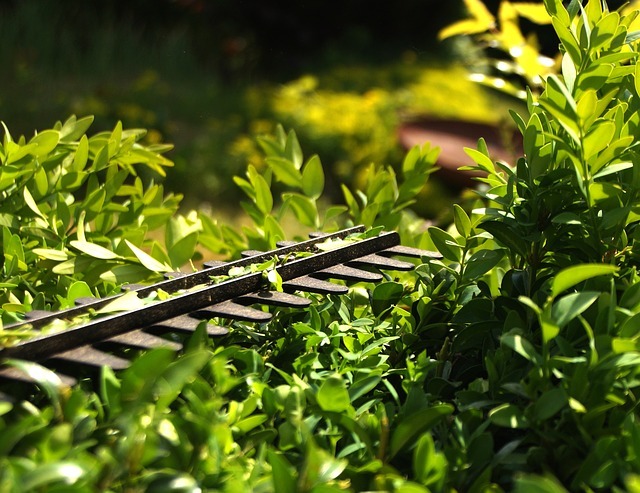 If you set this up outdoors, you can use the anchors that come with it if you desire, but you won’t need them! 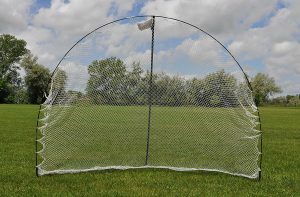 This is one strong net that can be used for practicing your golf swing, but also for baseball, disc golf, soccer, lacrosse and other sports where you’d like a net! We highly recommend it for anyone who wants to improve their game from the comfort of their own backyard! If you’re looking for all of the great features of a driving range, just in your own backyard, this is a bundle set you definitely need to check out! 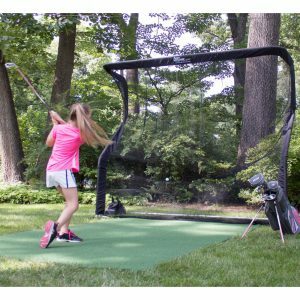 It comes with the top quality 10×7′ SPDR Driving Net (SPDR = Self-contained Portable Driving Range – this is the net that has the knotless netting and awesome ball return feature, and is the same net that we recommended as our #1 golf net for the backyard). THIS SET HOWEVER also comes with a tri-turf hitting mat, two extra attachable barrier protective wings (not pictured here), and a 4′ long carrying bag that’s apparently very easy to pack everything into when you want the extra yard room back. The extra barrier protective wings are a nice extra that you get with this package – especially for those of you (us) who are nervous about loosing the golf ball to the neighbour’s yard with a crazy hook or slice. They are removable (you attach them if desired to the main net), and when pulled out you can choose to either stake them to the ground or weigh them down in their corner pockets. This Rukket SPDR net is strong enough to handle whatever you hit at it (or kick, throw, or knock at it). You can use real golf balls, and swing full force with any club in your bag without fear that the ball will either go through it or that the force will knock it over… the powder-coated metal bars are extremely sturdy (yet have a soft rubber base so that you can bring this safely indoors if you have the room). One of the things we love about this practice golf net is that it’s so easy to take down… and the net, once put on, stays on even when you pack it away for storage! And with only 2 minutes to set back up, you’ll be deep into your practice time in a flash! This is a 7 x 7′ golf practice net that is a great option if you’re looking for something a bit more economical than the Rukket options above. It comes with the net, stand, ground anchors, and a carrying bag. The PowerNet golf net is made with knot-less netting, and can easily handle real golf balls with any driver or club in your bag! According to the many reviews I read on this one, customer service from PowerNet is fantastic! 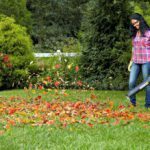 The product comes with a lifetime warranty on parts, so you can feel pretty sure that they stand behind their product, and that you’ll be happy with it, even with the lower price! The PowerNet advertises that this net is also great for use with soccer, lacrosse, football, and baseball practice – definitely a multi-use item! One of the things some golf nets for the backyard have that this one doe NOT have is the ball return design or side panels. You may have to move a wee bit more to get set up for the next hit, but if you aren’t worried about that, this net should definitely be one of your contenders! 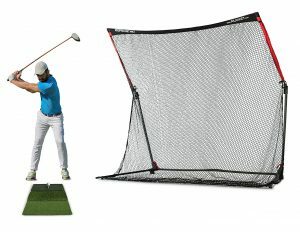 This is the golf net for serious golfers, and while it does come with a serious price tag, it is pretty awesome! It’s the only golf net that automatically returns the ball to the feet of the golfer, every time, and it comes with a 250,000 shot guarantee (that’ll take even serious golfers a while to hit). 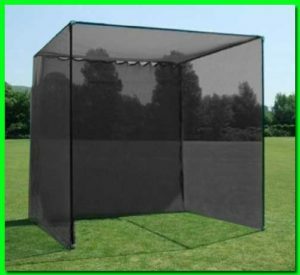 The commercial grade heavy-duty polyester net can handle drives of up to 225MPH, as well as balls from any other sport as well (baseball, lacrosse, hockey, football, soccer, etc)! 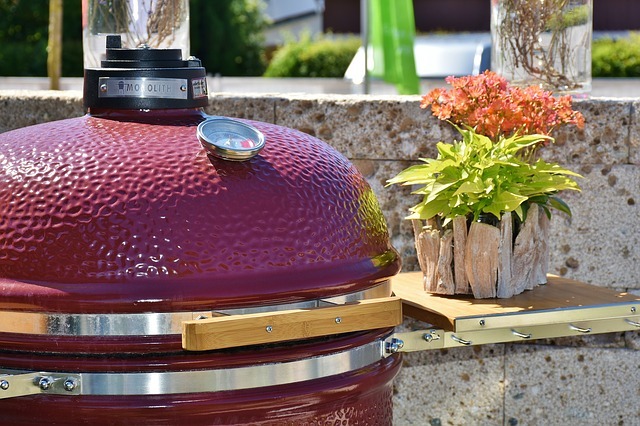 The frame comes with a rust-resistant aluminum frame, and is easily assembled and disassembled in just minutes with the color-coded push-button system. The net slides on and off, and the whole thing can easily fit into the included carrying bag (total of 28lbs). 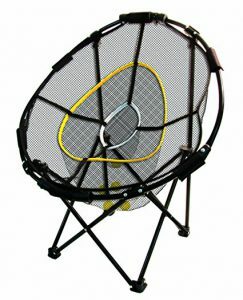 This is the ultimate golf practice net… but because of it’s heavy price tag, we’ve rated it at #4. If price isn’t an issue for you, we recommend this one. 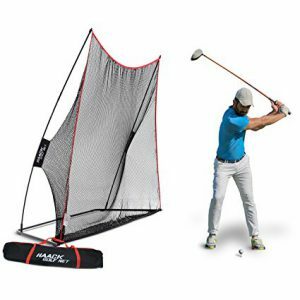 This is one of the least expensive golf nets for the backyard that we have on this list, but it has surprisingly great reviews for something so “cheap”! If you’re looking for a basic net, something that will stop real golf balls, and something that’s easy to set up, this is a pretty decent option. Although it does not come with protective wings and does not have the ball return design, it does the trick! The frame is made of fiberglass rods (not metal), and the net attaches with plastic rings. This golf practice net, once assemble, apparently it isn’t all that heavy – customers say that it need either anchoring or some extra weight on the base to keep it stable during play (suggestions are to use a brick or sandbag). If you live in a windy area, or plan to put this net permanently out in the open somewhere, we do suggest you look at a different option, unfortunately. This is due to the light frame apparently not being strong enough to handle heavy gusts, and reports of it bending out of shape too quickly. In a protected area however, you should be just fine with this one! Are you hoping for something that encloses you a bit more than a standard net, so that every shank, hook, and slice get caught? This 10 x 10 x 10′ golf practice net isn’t just a net… it’s pretty much a 3-sided cage! It’s hard to tell on the product picture, but there are actually 2 layers to the net at the back of the cage – there’s a second, separate net (the baffle, made of archery netting) that hangs about 1 foot in front of the back of the cage. The rest of the cage netting is one piece, and made out of commercial grade netting. The baffle helps ensure that NO balls get through – according to reviews, the first net stop even the hardest drives… with real golf balls and any club in your bag! Heads up for this one: The package comes with 1″ steel corners, but you will need to purchase twelve 10′ lengths of EMT Steel (conduit) to complete the assembly of your frame. The EMT Steel can be found at your local home improvement store (Lowes, Home Depot both carry it) and is very inexpensive. Everything else is included to set it up though! 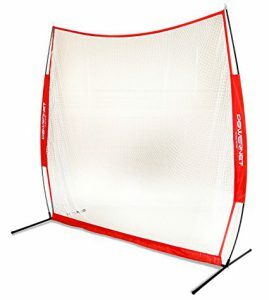 This is one heavy duty golf practice net – but you can use it for other sports as well (tennis, football, baseball, soccer, etc)! 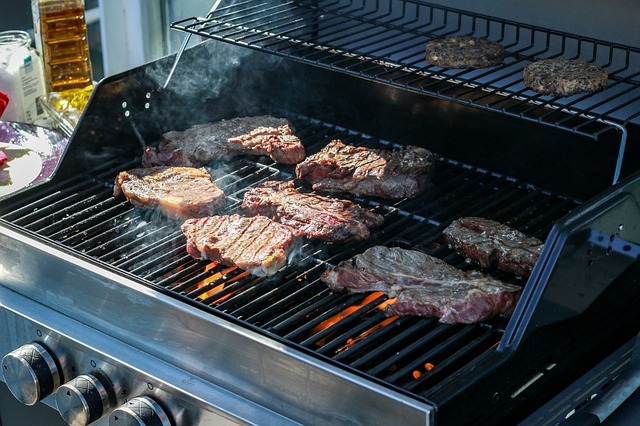 It’ll be one you set up and leave up… and enjoy for years and years! If you’re looking for the full package at a reasonable price, a golf practice net for your backyard that comes with a detachable/attachable chipping ring target, this is absolutely one of the best options. Hundreds of buyers together rate this one nearly perfect (there’s not even 1 negative review) – odds are you’ll love it too! The Target Cloth: It’s a patented material that absorbs the sound and protects the back net… NO ball is getting through! The painted on bulls’ eye target will give you something to aim at! The Bottom Net: It’s designed to cradle your ball so that it never slams down into the ground (saves your balls AND the ground, especially if you’re playing on cement). The White Guideline: One of the things we like best about this practice net is the white line painted on the bottom net. It allows you to quickly determine how straight your shot was. If you hit the target right on, the ball will drop down and return to you right along the line. 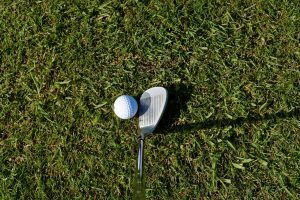 If you shank, hook, or slice it, you’ll be able to tell, as the ball will have to roll back to the center line after it drops. 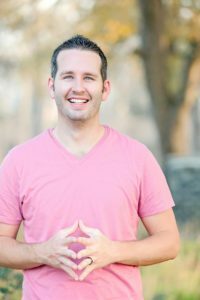 This is GREAT for helping you see exactly how you’re doing – and what you need to be working on! Ball Stopper Vs Auto Return: You have the choice of practicing with just one ball, using the auto return feature, or you can attach the ball stopper net, which will hold up to 200 balls! The Frame: There’s a one year warranty on the frame! Assembly: The Spornia golf net can be popped up in literally just a minute or two… and it comes with a handy carrying bag/storage bag. Check out how easy it is to set up and take down, and how it works in the video below! The Spornia SPG-5 is definitely one of the best golf practice nets on the market. We highly recommend you check it out! We’re pretty excited about this golf practice net with chipping target – especially for the attractive price! It’s just a simple, 2 minute set up, and you’ll be ready to go! It doesn’t have a fancy “ball return design”, if you’re ok with that, definitely take a look at this option. We like that this removable chipping net has 4 different chipping targets on the cloth and that you an adjust the height for the target! While they are vertical target holes instead of a horizontal basket you’re aiming to land in (like the Spornia option), this is great for really specific placement practice. You can order this in 6 x 6′ and 8 x 8′ options – both of which will be ideal for some, depending on where they want to play. While the net is sturdy and can stand on its own, it does come with 4 ground stakes for windy days. The frame is made of composite steel and fiberglass Tension-Tite materials, and the net of nylon. It’s ready for your best hit, so grab your real golf balls, your clubs, and get going – it won’t disappoint! 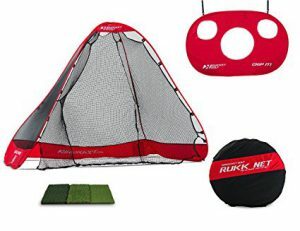 This is a fantastic bundle for the guy or girl who wants to have it all… a backyard portable driving net (10×7′) with a chipping target, tri-turf mat, and carrying bag. Buying as a bundle is a good way to save some money, by the way – and, think of how much you’ll save also not having to dish out dollars at the driving range every night too! Deal! Rukket is a great brand for driving nets – they appear several times on our “best of” list. The net quality, the easy assembly and portability, and of course, the Rukket brand awesome roll-back feature that lets you practice with just one ball over and over… this is a great choice! The net on this one is 5 ply knotless weave. Knotless allows the power in the shot to be dispersed evenly – which drops the ball smoothly and straight down, back to your feet. The base of the net is double layered, to protect your balls and your floor from the damage made by lots of contact. The Tri Turf portable folding mat has a no skid base; it’ll stay put it anywhere! The 3 steps are 16mm Putting Green, 35mm Rough turf, 35mm Tee turf… all on 2mm Nature Rubber. The main negative issue with this one that we discovered is that the folding up of the net has been a bit of a challenge for several reviewers. The net folds down into a circle, the same shape as the bag. If you bend it the wrong direction, you’ll be frustrated quickly! Thankfully, the specific and detailed instructions for the quick fold process are printed right on the net itself, so once you follow them and practice a few times, it does apparently become a simple process. The shape of this net is a wee bit different, but it maintains high reviews and the majority customers love it. Size wise, it’s 10′ W x 7′ H x 5′ D – you can pop it anywhere! 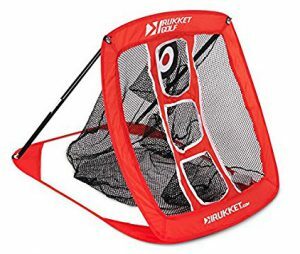 Rukket also claims this is a multi-sport net, so feel free to use it for baseball practice, or lacrosse, soccer, etc! This chipping net has actually 3 different sized nets in one… a small, medium, and large – sort of like a bull’s-eye. You can adjust the height and get busy chipping away at your golf game! Once you’ve hit all of your balls, gather them out of the bottom of the net and go again! The target folds up from 23″ diameter down to 7″ diameter, just one simple fold. It’s portable and easy to bring wherever you want to use it… camping? The golf course? Your friend’s backyard? It’s a quality product for a surprisingly cheap price! This net is 25 x 20″, and has 3 tiered target baskets to aim at (thus the name “Skee” after the game “Skeeball”). The top basket has a target drop-cloth to aim at. Should you miss any of the three small baskets, the balls will be caught by the side nets – no fear of having to chase them down (unless you really have a lot of chipping practice to do and miss it entirely). The 3 tiers allow you to practice a variety of shots, and the side pockets stopping the wide shots will help you learn to aim and place your shots better. Plus, you can invent new chipping challenge games! According to the many customers who reviewed it, it’s a great product except for the fact that it does not come with any ground stakes. And apparently they are definitely needed if you have any wind at all… it’s a light product. Tent pegs, spare bricks, sand-bags… anything that can weigh the frame down will help this though. All in all, you should be happy with this product, and get lots of practice fun out of it! This is a pretty simple product, but very effective. 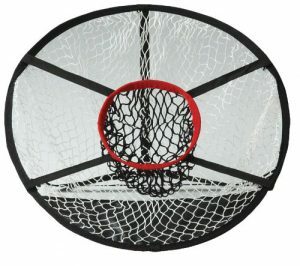 It has a single red bull’s eye target basket in the center of the 24″ diameter net – simple, instant feedback on your shot. This chipping net DOES come with anchors, unless the Rukket above, so you can stake it down outside when you’re practicing in windier weather. The red basket is actually removable – you attach it by Velcro. Some like this feature, as it allows them to return all of their practice balls to where they were hitting from in a basket of sorts, but others find they would have preferred it being one piece with the rest of the net. The net is fairly baggy too – some complained it was almost too baggy to allow for easy ball removal. Still, for the price, it’s a decent buy. That’s a wrap! Hope you found one of these best golf nets for the backyard to be exactly what you’re looking for in 2019! Drop us a comment, question, or any feedback you have and we’ll get back to you quickly! 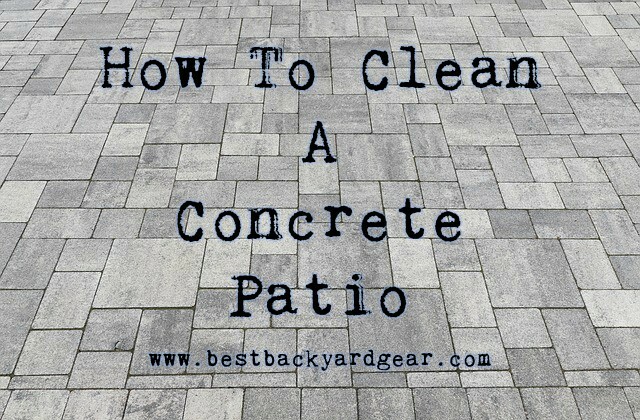 Before heading out, we also invite you to browse around our site and check out any of the awesome backyard gear we feature and review here! From the best free standing hammocks to the best outdoor games for adults, there’s something for everyone! Great website regarding golf nets, I’ve actually been talking about one of these recently to put into our garden, as I enjoy playing golf, so found this really enjoyable to read. I also wasn’t aware of the broad range of nets you could get. A real eye opener. Thanks for the feedback, Steven! I appreciate that you took the time to write in! What do you think – would you get a driving net, driving net with chipping target, or just chipping target? I’m curious as to the favorites out there!